Snow, or sneaux as we call it in Southeast Louisiana, is a rare event and only occurs every seven to ten years—yes years—I believed the heavy dusting we received would be a welcomed event—I was wrong. 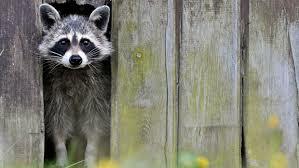 In Europe, raccoons are known as water bears for their love of playing and dunking. Rodney does share the trait, dipping everything he can find in his water bowl. From stuffed toys to TV remotes, to his father’s cell phone, we have become experts in drying out electronics—but nothing prepared us for Rodney’s reaction to sneaux day. He first settled in front of a window overlooking our backyard to witness the winter wonderland. I went outside, made snowballs, tossed them at the window to generate his interest and then built a snowman while he watched, seeming fascinated. The plan was to take him out in small steps: let him look out the door, set his paws in the cold stuff, and then have some fun. He was reluctant to leave the house, especially after his Chihuahua siblings balked at the idea of heading out into the icky snow. Rodney takes his cues, being his family, he looks to them for guidance, and also for tips on how not to do what Mommy says. I figured he needed coaxing. This is a once in a lifetime event for him, so I tried charming his big sister Chihuahua outside, hoping he’d follow her lead. He plopped down inside the back door and watched her tiptoe around the snow. Next, I brought a few snowballs indoors for him to check out. Big mistake. The snowballs quickly left the safety of my closed-in patio and were swatted across the floor and into my home. I chased the hockey playing varmint all over my living room and kitchen, following the wet track of snow across my rugs and tile floor. But it wasn’t only a single line of water I chased; it was a drenched raccoon. He was akin to a Roomba mop going over and over my floors and carpets, so I considered my wet raccoon an opportunity to clean house. That was until he decided his four-pound Chihuahua brother worked better as a mop than he did. The cries for help from my littlest Chihuahua sent me into a panic as I chased Rodney and his victim around my house. My two other Chihuahuas, incensed by the noise, also joined in the pursuit. All the while, my floors, and rugs became wetter and wetter. When the hostage got away, Rodney returned to the enclosed patio and went to the back door. Was this a sign he was ready to venture outdoors? I opened the door, eager to see if he would go, but to my surprise, he gathered up handfuls of snow from the doorstep and ran back into the house ready to have more fun. By the end of my thirty-minute “chasing Rodney” aerobics class, me, three chihuahuas and one very fat raccoon were soaked through and my house looked like Moses had parted the Red Sea across my living room. Despite the numerous attempts at escape and protests, everyone got toweled off and set on the sofa to be good while Mommy cleaned up. With the TV set to HBO, Rodney lounged with his bowl of popcorn watching John Wick II—he loves John Wick movies—while I mopped my floors. The Chihuahuas were so exhausted they fell right asleep. An hour later, my clean floors still damp while I retreated to the kitchen. The noise of the TV in the background and no other sounds assured me my kids remained tuckered from their adventure. But when I stepped back into the living room, coonie prints were everywhere. Where is he? I found him in his room, asleep in his green, fuzzy hammock and covered with flecks of popcorn, playing the innocent angel. I should have known. He has a homing device for disaster. He can detect any wet floor in the house and leave his signature prints behind. Instead of mopping again, his footprints were left to dry. I find it makes quite the conversation piece when the remaining one friend I have comes over (the one Rodney didn’t chase away). “You should put those on a T-shirt,” she always says. Sneaux was bad enough, but Rodney and ink, I shudder at the thought.